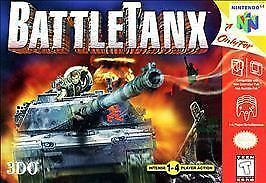 Battle Tanx for Nintendo 64 takes place in a post-apocalyptic world, where humanity is on the verge of extinction thanks to a virus that eliminated most of the female population. Play as a lone soldier who sets out to save the world from these marauding misfits. Throughout the game you'll use three different tanks, each with its own capabilities. Play through 15 levels based in five different American cities: Washington, San Francisco, Las Vegas, New York, and Los Angeles.